04-Aug-2015 -- I had put my tent at Hallmark Holidays, a small campsite, at 20 km NNW (46.14795°N 0.112686°W) of the DCP that I intended to visit the next day. Although it was in the beginning of August, the holiday month for the French people, I was all alone which I liked. Next morning I took the D737 to Chef-Boutonne, to Loubillé, and finally through Longré. 250 m after the last house of Longré I turned left at a tire station. Following this road for 1250 m and turning sharp left at the crossroads I parked my car after 1150 m in La Charrière and started walking. Following the edge of the field between me and the DCP I had to deviate from desired track until I reached a double row of trees in which a dry river was hidden. Following the river I returned to the desired track. The DCP is in a vast field at 170 m of a road. I could have driven by car to this point, but my car navigation did not show this road. The field was already harvested. I walked to the DCP, building up a clay layer under my shoes. In a detailed photograph the enormous amount of stones in the soil is shown. 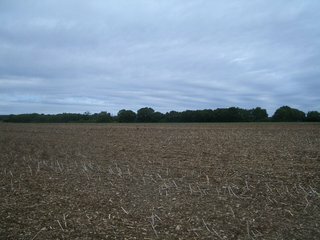 The photographs looking North, East, South and West show a relative flat agricultural area. A collection of flowers and a couple of snails is collected; the white flower on top-right is a variant of the blue one. The snails are preparing new snails. About 14 km NW of the DCP, in Javarzay close to Chef-Boutonne is a beautiful castle (46.1089°N 0.08352°W). Inside is a museum with a section about Jean-François Cail, a talented inventor, constructor and industrial genius of the 19th century, see Wikipedia (in French). For those who like cognac, the city of Cognac is only 40 km SW of the DCP.